The airport was built in 1939 to replace Böblingen Airport. In 1945, the United States Army took over the airport until returning it to German authorities in 1948. For the duration of the Cold War the runway and facilities were shared with the United States Army who operated helicopters, the Grumman OV-1 Mohawk and other fixed wing aircraft as Echterdingen Army Airfield on the southern portion of the airfield. Some of the units operating at Echterdingen were headquartered at nearby Nellingen Kaserne- now closed and redeveloped. In 1984-5, the 223rd Aviation Battalion (Combat) of the 11th Aviation Group (Combat) was headquartered at Echterdingen, with three aviation companies assigned (one at Schwäbisch Hall). The U.S. Army still maintains a small helicopter base - Stuttgart Army Airfield - on the southern side of the airport, which it shares with the Baden-Württemberg State Police helicopter wing. The police helicopter wing falls under the control of Stuttgart Police Department and has six modern helicopters based at Stuttgart and two in Söllingen. 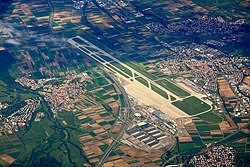 The airport was expanded after World War II. The runway was extended to 1,800 m (5,906 ft) in 1948, then to 2,250 m (7,382 ft) in 1961 and finally to 3,345 m (10,974 ft) in 1996. The original 1938 terminal was finally replaced in 2004 and there are now four terminals with a maximum capacity of approximately 12 million passengers. Politicians, town planners and nearby residents have been arguing for years about the construction of a second runway. However, on 25 June 2008 Minister-President Günther Oettinger announced that for the next 8–12 years no second runway will be built and that the restrictions for night operations stay in place. After the death of former mayor Manfred Rommel in November 2013 local politicians proposed to rename the airport after him. This proposal caused public disputes as he was the son of Erwin Rommel but also highly respected for his work on intercultural affairs. In July 2014 it has been announced that the airport will be named Flughafen Stuttgart - Manfred Rommel Flughafen from now on. In September 2016, the airport unveiled new branding and corporate design, changing its official name from Flughafen Stuttgart to Stuttgart Airport. In September 2014, United Airlines cancelled their route to Stuttgart from Newark due to insufficient demand leaving Stuttgart Airport with only one remaining long-haul connection to Atlanta provided by Delta Air Lines. In October 2014, easyJet announced they would serve Stuttgart as their seventh German destination by March 2015. In December 2014, Ryanair also announced added Stuttgart six weekly flights to Manchester from April 2015. Air Berlin announced the start of a service to Abu Dhabi from December 2014. On 31 May 2016, Air Berlin ceased its flights to Abu Dhabi. In October 2016, Air Berlin announced it would close its maintenance facilities at the airport due to cost cutting and restructuring measures. 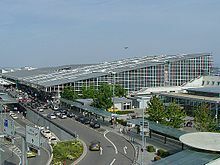 Stuttgart Airport consists of four passenger terminals which have separate check-in facilities and entrances but are directly connected to each other and share a single airside area which features eight Jet bridges as well as about two dozen bus-boarding stands. Terminal 1 is the first of two landside main halls and features together with its addition Terminal 1-West 50 check-in counters. It shares the roof with Terminals 2 and 3 and is mainly used by Eurowings and Lufthansa. Terminal 2 is a small area featuring nine check-in counters and a security checkpoint. It is located within the shopping area between the main halls of Terminals 1 and 3. It is used by Eurowings in addition to their counters in Terminal 1. Terminal 3 is the second of the two landside main halls east of Terminal 1 and 2 and features 39 additional check-in counters. It is used by TUIfly and KLM among several other airlines. 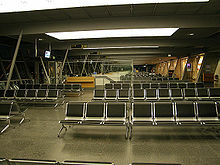 Terminal 4 is, unlike the other three terminals, a separate and very basic equipped building to the east of Terminals 1 to 3 but also connected to them by a walk way. It features 17 more check-in counters as well as several bus-boarding gates and is used mostly for holiday charter operations. In March 2018, the airport administration announced that Terminal 4 will be entirely rebuilt and expanded in the coming years. There are two major highways: Just north of the airport runs the Bundesautobahn 8 (A8), which connects the cities of Karlsruhe and Stuttgart to Ulm, Augsburg and Munich. The Bundesstraße 27 (B27) leads to downtown Stuttgart, as well as to Tübingen and Reutlingen in the South. From the regional cities of Esslingen am Neckar, Reutlingen, Tübingen and Kirchheim exists a connection by coach. Additionally, German long-distance coach operators DeinBus and Flixbus maintain their stop for Stuttgart on the airport grounds with direct connections to several major cities. Stuttgart Airport can be easily reached within 30 minutes from the city's main railway station using the Stuttgart suburban railway S2 or S3 from Stuttgart Flughafen/Messe station. It is planned to connect the airport with the future Stuttgart - Ulm high-speed railway line currently under construction as part of the major Stuttgart 21 railway redevelopment program. Therefore, a new long-distance train station will be built on the airport's grounds near the existing suburban railway station. The new station, which will be served by ICE high-speed trains will be connected to the new line by an underground loop track. The Stuttgart-Ulm line is scheduled to be opened in 2020 while the new airport connection is planned to be inaugurated in 2022. On 19 January 2010, Bin Air Swearingen SA-227-C Metro D-CKPP was damaged when the right main undercarriage collapsed on landing. On 14 September 2009, a Contact Air Fokker 100 hit the runway without part of its landing gear extended. One flight attendant was injured. ^ a b "EAD Basic". Euro Control. Retrieved 6 June 2012. ^ "Namenserweiterung in Manfred Rommel Flughafen" (Press release) (in German). Flughafen Stuttgart GmbH. 22 October 2014. Archived from the original on 7 November 2014. Retrieved 7 November 2014. ^ Isby and Kamps, Armies of NATO's Central Front, Jane's, 1985, 375. ^ Flughafen bekommt keine zweite Startbahn Archived 16 September 2010 at the Wayback Machine. Stuttgarter Zeitung online vom 25. Juni 2008 (in German). ^ Das Versprechen gilt nur auf "absehbare Zeit" Archived 26 June 2008 at the Wayback Machine. Stuttgarter Zeitung online vom 25. Juni 2008 (in German). ^ "aero.de - Luftfahrt-Nachrichten und -Community". aero.de. Retrieved 4 June 2015. ^ FVW Medien GmbH. "United Airlines: Aus für Stuttgart–New York". biztravel.de. Retrieved 4 June 2015. ^ FVW Medien GmbH. "Easyjet: Noch drei Deutschland-Routen". biztravel.de. Retrieved 4 June 2015. ^ "airberlin presse – airberlin plant Flüge von Stuttgart nach Abu Dhabi". Retrieved 4 June 2015. ^ "Terminal guide". Retrieved 4 June 2015. ^ "Saisonflugplan". Retrieved 4 June 2015. ^ "Corendon Airlines Starts Izmir Flights in 2019 Season". corendonairlines.com. 2 October 2018. ^ a b c d e f g h i j k "Laudamotion outlines S19 Stuttgart network". routesonline.com. 18 October 2018. ^ a b c "Timetable". Ryanair DAC. Retrieved 27 February 2019. ^ a b 2018, UBM (UK) Ltd. "SunExpress Germany S19 network additions as of 18OCT18". routesonline.com. ^ "Turkish Airlines adds Antalya – Stuttgart service in S19". routesonline. Retrieved 14 December 2018. ^ a b "Statistisches Bundesamt: Luftverkehr auf Hauptverkehrsflughäfen Publikation 2017" (PDF). Destatis. Retrieved 5 August 2018. ^ "Accident: BinAir SW4 at Stuttgart on Jan 19th 2010, right main gear collapsed on landing". The Aviation Herald. Retrieved 20 January 2010.